In January 1998 I measured the heights of the 77 apple trees then growing in our orchard and plotted tree height against age to get a growth curve. In November 2000 I made new measurements of the 100 trees now growing. The results are shown in four graphs below. In the first graph, both 1998 and 2000 data are plotted together and these show the same overall trend. 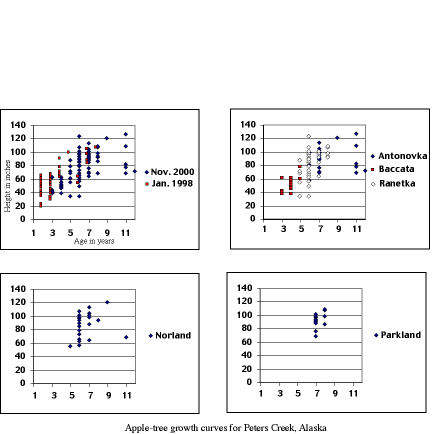 A second graph shows height versus age for trees plotted with a different symbol depending on whether they are on Antonovka, Baccata, or Ranetka rootstock. Because most of the oldest trees are on Antonovka and most of the youngest are on Baccata,, direct comparisons are not possible. 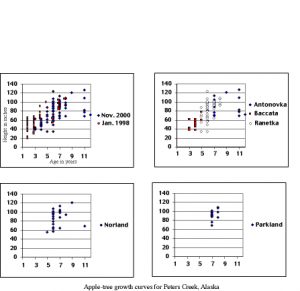 Nonetheless, each of the three rootstocks seems to follow the same growth curve and there is no obvious difference between them. The third and fourth graphs show just the Norlands and just the Parklands respectively. I had hoped that this would reveal something about the differences in growth habit between the two, but the data, when superimposed, essentially overlap. Age in years (a tree grafted in Spring 1999 will have an age of 2 as of Dec. 2000, as it will have lived through two growing seasons).